WASHINGTON (Jan. 31, 2012) -- Amidst concerns of budget and troop reductions, Reserve Soldiers remain a critical component of America's defense, said the chief of the Army Reserve. During his visits around the force, Lt. Gen. Jack C. Stultz, chief, Army Reserve said the No. 1 question he's asked by Soldiers is "what's going on" with regards to budget and force cuts. Those Soldiers, Stultz said, are concerned about the future of their jobs and their relevance in America's defense. Amidst concerns of budget and troop reductions, Reserve Soldiers remain a critical component of America's defense, said Lt. Gen. Jack C. Stultz, chief, Army Reserve. The general spoke during a Jan. 31, 2012, meeting of the Reserve Officer Association in Washington, D.C.
"My answer to the Soldiers is, 'You are going to become even more relevant than you've ever been to our national security strategy,'" Stultz said, Jan. 31, at a meeting of the Reserve Officer Association in Washington, D.C. The active duty Army will draw down from 570,000 Soldiers to 490,000 Soldiers over the next six years. The growth to 570,000 Soldiers was a result of the wars in Iraq and Afghanistan. During that time, Stultz said, the Army relied heavily on the Reserve to fulfill important combat support and combat service support missions. The Reserve, he added, is where the bulk of combat support, or CS, and combat service support, known as CSS, Soldiers reside. "To the point where today, if you're in the transportation community in the Guard and Reserve, you represent about 80-85 percent of the Army's capability," Stultz said, adding that for engineers, that number is about 75 percent. The Reserve components also represent about 70 percent of the Army's medical capacity, about 85 percent of its civil affairs capacity, about 66 percent of the Army's logistics capacity and about 70 percent of its military police. "Our nation and our military are going to be dependent on access to the Reserve components," Stultz said. And the nation expects the Reserve to be ready. An operational Reserve, he said starts with capability. That means a force with capabilities that can be maintained, that is ready on short notice without the need for a lot of additional training, and that is accessible. An operational Reserve is a force made of Soldiers who are also civilians. Those Soldiers must be able to maintain their military skill set even when they are not in uniform -- so when they are called upon, they are ready. To make that happen, Stultz said, the Reserve must focus on being a force that provides skill sets that are shared among both the military and the civilian communities. The Reserve component is able to maintain a ready cadre of Soldiers in the medical field because many of those Soldiers are working related jobs in the private sector. There, Stultz said, they are getting great training -- sometimes even better than what's available in the military. The same is true for engineers and other "hard skills" like electricians, carpenters and plumbers. "To me, an operational Reserve is where you can have those capabilities," he said. "If I need some engineer capability, but I don't need a whole battalion, can you give it to me?" he asked. "If we don't have the employers and we don't have the families, we won't have the Soldiers," Stultz said. "We have to make the employers part of this equation." "There's a value of having a Soldier as an employee," Stultz said. "If we are going to have this operational Reserve, we are going to have to have some confidence we can get to them when we need them, and have the employers say, 'We support you.'" Soldiers have asked for three things from the Reserve, Stultz said. They want predictability -- and their civilian employers do too, they want the Reserve to put them and their skills to good use and above all, they don't want their time wasted. Stultz said the Reserve recognizes that Soldiers have been to Iraq and Afghanistan -- they've trained hard for that, and they've got combat experience under their belts. Now, he said, they want to maintain that experience and skill -- they don't' want their time wasted with what they consider irrelevant training. "Don't expect me to show up at a drill hall and sit in a classroom and listen to some PowerPoint presentation -- that's not relevant," he said, relaying sentiments he's heard from Soldiers. "Make the training worthwhile." To that end, Stultz said, the Reserve is investing in simulator training, including those for weapons systems and vehicle simulators. "That is what we want that Soldier to experience when he comes to that drill -- something realistic." "That's were that predictability, that five-year model comes into play," he said. Four years at home for a Reserve Soldier means predictability for him, his family and his employer -- after that, they want the opportunity to put their training to use doing something meaningful for the Reserve. "If you look at what's a huge demand now, it is a lot of stability, theater-engaged, security-cooperation types of work that we've been doing," he said. Included in those kinds of engagements are medical readiness exercises abroad in countries like El Salvador, Guatemala, Costa Rica, Panama, Columbia and Haiti. The Reserve could provide hospital units to the Southern Command, for instance, allowing expansion of engagement opportunities. Engineer units, he added, could be deployed a company at a time, for 90 days each and overlapping -- "Let them build a school all through the year." Stultz said he told the Army's chief of staff if he could change one thing about the Army, he'd like to create an Army culture that supported the notion of "a Soldier for life." A "Soldier for life" culture, he said, provides Soldiers a way to continue to serve their country full time, or part time -- explaining that some Soldiers might want to serve part time, but simply don't' know how to make it happen. "If we're going to come down from 570,000 to 490,000 on the active side, think of the investment that is going to walk out the door if we don't have the right transition program in place," he said. 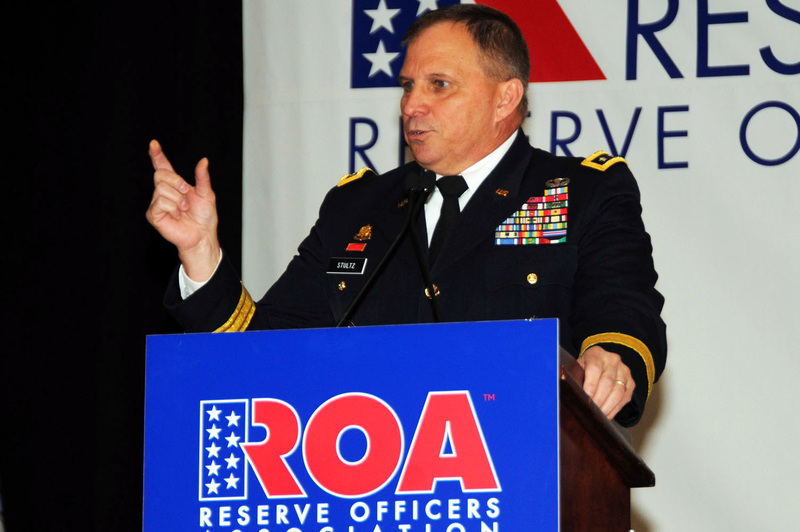 The Reserve is working closely with the Army to minimize that loss of investment, Stultz said. He also stressed the importance of informing Soldiers of their options as they prepare to leave the active component. Additionally, the important relationships the Reserve has built with civilian employers makes it easier for Soldiers to find jobs as they prepare to move out of the active Army -- and that makes it easier to choose to stay in the Army as a member of the Reserve. "For every one of those that transitions into the reserve, that's one less recruit to pay a bonus to, that's one less triaging seat at Fort Jackson (S.C.) or Fort Benning (Ga.) -- because we've already invested in that Soldier," Stultz said.